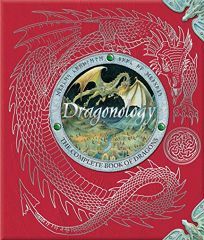 With its faux-leather, gemstone-encrusted cover and timeworn pages, Dr. Ernest Drake's Dragonology: The Complete Book of Dragons, ed. by Dugald A. Steer, ""purports to be the facsimile of an 1895 [book]"" (according to a publisher's note), and is quite convincing as the long-lost research of 19th-century dragonologist Drake. Presenting a ""scientific"" study of dragons, the volume examines the different dragon species and their behavior, using fold-out flaps, patches of textured ""skin"" or ""membranes,"" and sample science-notebook-style labeled drawings. In addition to the clever text and persuasive illustrations by Helen Ward, Douglas Carrel and Wayne Anderson, the interactive book includes an insert on dragon script, a mini-book of dragon riddles and a glass dragon eye bound into the back cover. An afterword concludes, ""Cherish all animals. Then one day the world may at last learn to accept the honourable science of dragonology.""